Discussion in 'Google TV Hardware Discussion' started by sparkyscott21, Dec 30, 2010. HomePlug AV networking technology uses your home's existing electrical wiring to turn any outlet into an Internet connection, so you can use your Logitech Revue™ with Google TV™, TiVo®, game console, TV, computer or any device with an Ethernet connection in any room in your home. You'll be up and running in seconds thanks to the plug-and-play setup that provides a reliable Internet connection without new wiring, networking hassles or software to install. 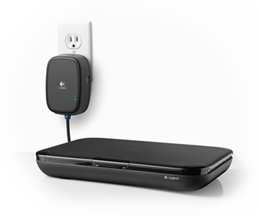 With up to 200 Mbps data transmission, you can reliably stream HD movies and make HD video calls on your Logitech Revue with Google TV (and any other connected devices). * *Data transfer rates may vary depending on your Internet connection and the capabilities of your connected devices. The kit includes everything you need to start your powerline network-one adapter to connect to your router and another to connect to any device that needs an Internet connection. Want to add another device to your existing powerline network? Howdy Dan! Not this particular brand (which is pricey), but I used D-Link's version a few years ago (search Amazon/Newegg for 'powerline ethernet' or 'powerline networking') with great success until the electronics died after a year (likely the notorious cheap chinese capacitor issue). Got decent throughput, even when using the default encryption 'service' which can also be disabled, if you wish: single-family homes need not worry, but in a multi-family condo,etc. I'd keep it enabled. Run a small installer on the puter, plug both into outlets, wire up the router to one, a device on the other, follow a few prompts, and near-instant networking. Do you know if this can be used for a camera? My TV and Revue are separated by about 35 foot, which it's too long for the usb camera. The best way to extend usb over significant distances is to use ethernet cabling, which is what this appears to do? This PLN extends your actual network (one connects to router, other a device or switch/hub)...extending a USB device isn't its purpose. You could try some camera software that enables a digital Zoom effect..making a distant object (you) appear much closer. This is not an endorcement - but I use the Linksys Powerline adapter (PLK300 kit) for all of my streaming, works great!